Although as many as 80 percent of people in the U.S. might experience low back pain at some point in their lives, the pain is usually mild and lasts no longer than six weeks. Spondylosis, however, causes chronic back pain that lasts more than three months. Although spondylosis is primarily caused by aging and therefore somewhat unavoidable, certain exercises can relieve the pain caused by lumbar spondylosis. Pelvic tilts stretch the lower back and strengthen the lower abs. Begin by lying on your back with your legs straight. Rest one arm at your side and place one thumb on the side of your lower rib cage and the pinky of that hand on your hip bone. Then, press your lower back into the floor by contracting your abs. This stretches the lower back as it flattens to the floor and the pelvis tilts. The space between your fingers decreases as the pelvis tilts. Hold the position for five seconds. Curl-ups are basically crunches and strengthen the abdominals. The abs serve as a "front anchor" for your lumbar spine. 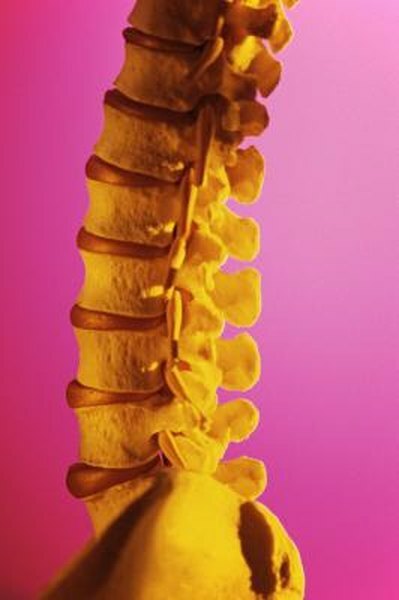 When they are strong enough to support the spine, you experience less pain. To perform curl-ups, lie on your back with your arms crossed on your chest. Bend your knees to right angles and keep your feet flat on the floor. In a smooth motion, raise your head and upper back off the floor. Breathe out as you curl up and breathe in as you lie back. Knee lifts strengthen the abs by stabilizing the spine while you march your legs off the floor. To begin, lie on your back with your knees bent and feet hip-width apart on the floor. Perform a pelvic tilt and tighten the abs. Then, raise your right foot three to four inches off the floor keeping the knee at a right angle. The lower back must stay flat on the floor for the exercise to work. Put the right foot down and repeat on the left leg. The hang is a yoga exercise for postural correction that benefits spondylosis sufferers by increasing space between the spinal vertebrae. This relieves pressure in the lower back through stretching the paraspinal muscles in the back. For this exercise, you need a high counter or table and another person to help. Hang over the edge of the counter and have someone hold your ankles. Cross your arms so you do not touch the floor. By hanging over the counter you allow the torso to relax because it doesn't need to support itself anymore. Relax in the position, take deep breaths and let gravity elongate your spine. When you are ready to get up, have your friend stand in front of you and help lift you from your shoulders.